Homeschool nature walks are a way to learn about the environment that you live in. It can also provide fun exercise for the whole family. Most of the walks that we have been on have been less than two miles round trip. We have even taken a baby stroller on a few. We like to find interruptive nature trails to walk. Interruptive Nature trails are usually short less than one mile. They usually have signs that describe the plants and history of the area. The trails are usually easy to walk. We have walked the nature trails at Mt. Rainier, Lake Washington, and Northwest Trek. Finding interpretive trails was more of an accident with us. When our children were young we looked for trails that they could walk or we could take a stroller on. Most interpretive trails are short and easy to walk. Many are wheel chair accessible. Libraries and bookstore have hiking books. Some books list self guided nature walks in their lists of hikes. Some parks have ranger led walks. The ranger will point out plants and wild life. Check with the ranger first if you can take small children. Sometimes the trail is too long or the ranger walks fast. We have several arboretums and Japanese gardens in the area. Both types of gardens have many plants that are labeled. A nursery or greenhouse would be another place to go for a homeschool nature walk where you can learn about plants. Oceans and tidal pools is another place to take a walk and observe nature. Lakes, rivers, and ponds are also fun to go to. Many beaches and forest parks also have guided tours. I have been on some and have learned interesting facts about the area. You can also go on a homeschool nature walk in your neighborhood. What you see will depend on where you go. Here is some of the plants and wild life that we have seen our our walks. 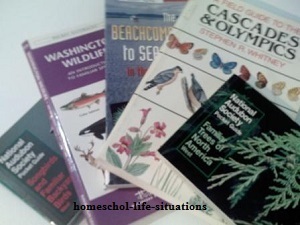 Field guides are important to have for homeschool nature walks. You and your child will want to learn the names of the different plants and animals you see. We have several field guides for the Pacific Northwest. I like the field guide of the Cascade and Olympic Mountains by the Mountaineers. It is a general guide listing plants, butterflies, birds, and animals that live in the area. The book gives lots of detail of each item. We also have several field guides put out by the National Audubon Society. We have one on tree and another one on birds. I like the colored pictures. There are even field guides for the night skies. You could observe stars and constellations at night. It is better to go away from the city to observe the stars. I try to remember to have my children bring a notebook and pencil with them when we go on nature walks. On each page of the notebook they can record the date and location. Then they can draw a picture of the plant or animal that they see. I have my child also write a short description of each item. They need to list the color and anything else that seems important. Don't forget to look for bugs and insects on your nature walks. If you don't have a field guide you could try to draw a picture and write down as much information as you can. Then when you get home look on the internet or in your field guides. Homeschool nature walks are a way to observe nature. They provide a fun way to learn science. You can go home and research all of the plants and animals that you observed. Going on nature walks is also a fun way to get exercise.